Contributing to these high yields were counties having average yields above 220 bushels per acre. Several of these counties were in the Northwest U.S. and Nebraska where irrigation often is used in corn production (see Figure 1). 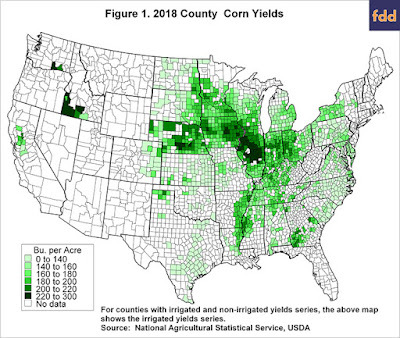 In predominately non-irrigated counties, there were a concentration of counties in eastern Iowa and extending through central Illinois with over 220 bushels per acre average yields (see Figure 1). Three counties in this region, all in Illinois, had average yields over 240 bushels per acre: Douglas County (246.0 bushels per acre), Piatt (241.8), and Warren (241.7). 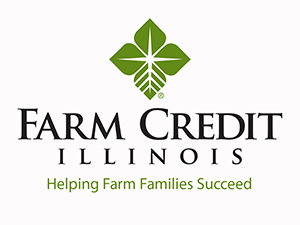 Eleven counties – again, all in Illinois – had average yields between 230 and 240 bushels per acre: Macon (239.9), Sangamon (236.4), Logan (236.2), Tazewell (235.4), Effingham (235.2), Coles (234.2), Stark (234.0), Moultrie (233.9), Hancock (233.9), Christian (232.9), and Mercer (231.3). Eighteen counties had yields between 220 and 230 bushels per acre: 6 counties in Iowa and 12 in Illinois. High yields are a measure of good growing conditions, but it does not take into consideration the inherent productivity of soil. Yield deviations from trend consider an area’s productivity. For each county, a 2018 trend yield was calculated using linear regression to fit a straight line through actual county yields from 1972 to 2017. The straight line then was extended to give the 2018 trend yield which represents the expected yield given approximately average growing conditions. A yield deviation then equals the actual yield minus the trend yield. A yield deviation of 20 bushels per acre means the actual 2018 yield is 20 bushels higher than the trend yield, an indicator of a very good yield. Conversely, a –20 yield deviation indicates that the county yield is 20 bushels below the trend yield, an indicator of poor growing conditions. As would be expected, eastern Iowa and central Illinois had yields with positive yield deviations, with many counties having yield trends above 30 bushels per acre (see Figure 2). Note that yield deviations paint a broader area of excellent yields. That area includes southern Illinois, central and southern Indiana, western Ohio, western Kentucky, and parts of central Tennessee. Other areas did not fare as well. Counties along the Iowa-Minnesota border had below-trend yields (see Figure 2). 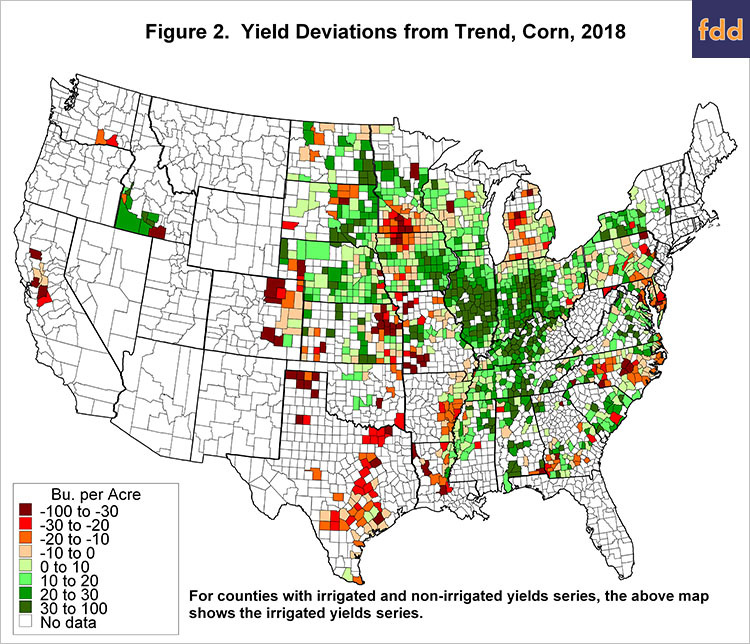 Other regions of poor yields in include Colorado, eastern Kansas and western Missouri, Texas, Arkansas and Louisiana, North Carolina, and New York. Soybeans Yields Similar to corn, soybeans almost had a record-breaking yield. The average U.S. soybean yield for 2018 was 51.6 bushels per acre, .3 bushels below the record yield set in 2016 of 51.9 bushels per acre. There were many areas of exceptional soybean yields (see Figure 3). Twenty-nine counties had average county yields over 70 bushels per acre. Three of these counties were in Nebraska: Gosper (75.2 bushels per acre), Dawson (73.2), and Buffalo (70.6). The remaining 26 counties were in Illinois. Three Illinois counties had average county yields over 80 bushels per acre: Sangamon County (82.3 bushels per acre), Morgan (81.6), and Douglas (80). 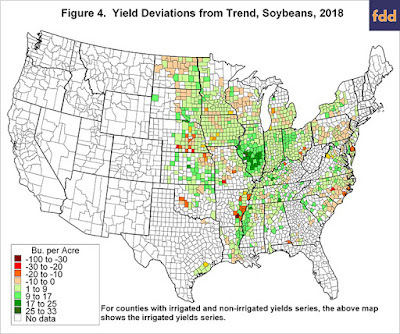 Yield deviations suggest that central and southern Illinois had exceptional growing conditions in 2018 (see Figure 4). Excellent growing conditions continued into Indiana, Ohio, Kentucky, and Tennessee. Other areas did not have as productive of a year. Yields were below trend along the Iowa-Minnesota board, North and South Dakota, Nebraska, Wisconsin, Michigan, Pennsylvania, and in North and South Dakota. Commentary The U.S. had near-record yields for corn and soybeans in 2018. Above-trend yields in central and southern Illinois, central and southern Indiana, western Ohio, Kentucky, and Tennessee where large contributors to the near-record U.S. yields. The examination of county yields suggests two warnings. 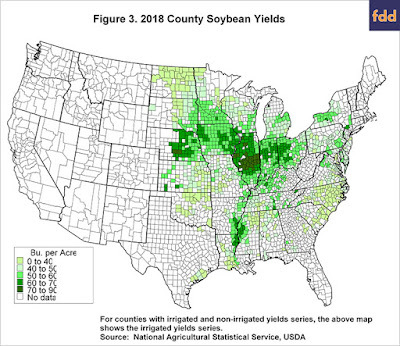 Illinois farmers should note that many several areas in the country had below-trend yields in 2018. Therefore, the 2018 experience indicates that below-trend yields are still possible. Illinois farmers should not plan on having above-trend yields in every year. It is entirely possible that the area of below-trend yields centered along the Iowa-Minnesota border in 2018 could occur in central Illinois. At the same time, Iowa and Minnesota could have above-trend yields. If that reversal occurs in 2019, there would be large, negative incomes on many Illinois farms. Somewhat counter to the first warning, the second warning is for the possibility of much larger national corn and soybean supplies. It is possible that all areas of the U.S. have above-trend yields. That is, the western Corn Belt could have had above-trend yields at the same time the eastern Corn Belt has above-trend yields. If this occurs, national yields would be record-breaking, resulting in falling corn and soybean prices, leading to very low farm incomes.